Earlier this year I restarted tracking my net worth with my normal boring excel document that I was using since graduating from college. In my old manual method of tracking I’d have to log onto each website, which included all my checking, savings, mortgage, credit cards, 401k, IRA, and money market accounts. Too collect all this data it would take about 30 minutes to have a complete financial picture of how our family was sitting, which I wanted to know at least once a month. In the frustration of spending time tracking all this data, I decided to search for an online net worth tracker. Through luck in my Google search I came upon, Mint.com. In looking through their online introduction (embedded below), and walking through Mint’s “How it works“, it seemed appealing. From watching their video, I was hooked right away! I was already sick of my manual tracking method and the time it took collect and organize my net worth information. I knew I needed a change. So I decided to take the plunge, and sign up. Since signing up, about 4 months ago, I have been completely blown away by this product! I’m amazed how much information it can collect, organize, and correlate data to easily understand where our family is headed financially based on our spending, saving, and earning. In using Mint.com, it’s often hard to contain myself with how impressed I am with it! It’s like when you find out something really cool that you think everyone should use! Ya know what I mean? (oh by the way…I or ThreeThriftyGuys.com haven’t received any financial proceeds from writing this, but is completely my opinion of the website and services). So, over the last four months, here are my opinions on features that have caught my eye in using Mint.com. 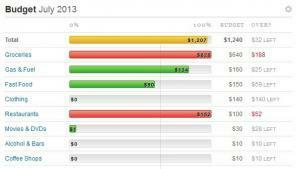 Tracking spending – with my old excel method I was never able to easily track my spending. Through integrating my multiple checking accounts and credit cards, it’s made it extremely easy to track our spending, create a budget, and show trends of spending. The more I’ve use Mint.com, the more it’s been able to create a full pictures of how we are spending money, and assist us in creating a budget. Notification and reminders – after you logon to your account and look over the “Overview” tab, you’ll notice the cool feature of “Upcoming Bills.” Right out of the box, Mint will realize when your bills are due (i.e. Credit card, mortgage, utilities, etc), and can setup notifications for these bills. For those of you who have a hard time remembering to pay certain bills that are set to automatic, then this will be extremely valuable, and will definitely help you save money on late fees or be deliquent. Overall, it will not only help ya save money, but assist ya in protecting your credit score. Investment tracking and portfolio management – in collecting all my account information I came to the realization that I have eight different investment accounts for my 401k, 403b, Roth IRA, and regular IRA. With so many accounts it makes it hard to actively monitor what percentages of my investments are in bonds, money market, and stocks (both international and domestic). Using Mint will allow you to have a basic overview of this data in one area, which was extremely hard to do before. 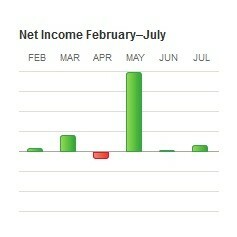 Monitor ‘Net Income Trends’ – one neat feature that is helpful month-over-month is the Net-Income graph. At the bottom left hand corner of the overview page you’ll see how much you are saving (or over spending) per month based on all your accounts (both checking and credit cards). Mint puts it in an easy to understand graph like the one on the right. For someone who has extremely varying income, then this might be helpful. Security – Mint.com uses all secure https connections both for inputting your account numbers and setting up your account. Also all account $ updates are done via secure html, and helps make sure all you data will be protected. So rest easy! Email notifications of saving interest rate changes – I frequently get e-mail notifications that my interest rate in my savings account or money market has changed, and Mint will let you know how much more you’ll make or lose. A lot of times we often overlook what our banks are doing, and pay little attention to their interest rates, but theses can have big financial impacts. Again, this will help empower you with making decisions on where to put your money, and help make a little more. Overall, I’ve have nothing but good things to say about Mint.com, and it’ll help you a lot in tracking your finances and have a constant picture of your net worth. What do you currently use to track your spending, income, or monitor your net worth? Have you ever used Mint.com? What are your thoughts?